Are you ready to explore further into the bay? Would you like to try your hand at an overnight trip? Sail to Benicia to explore a historic, quaint waterfront town with an active art community! 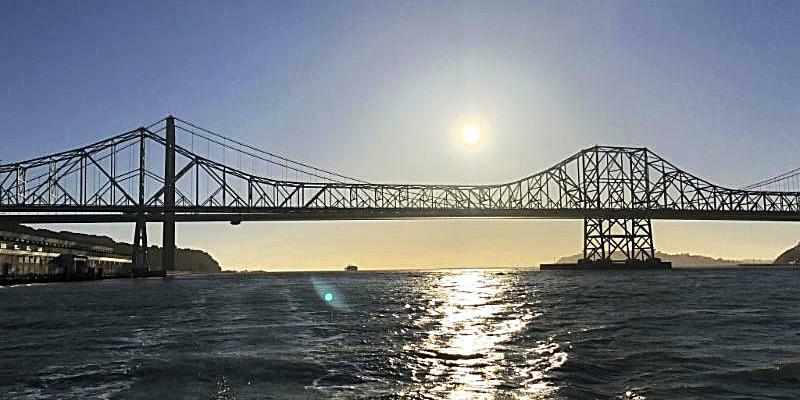 This local cruising guide offers an exciting overnight adventure - venturing into the San Pablo Bay, navigating new Straits, and a great selection of restaurants to reward you for your journey! Benicia provides all the benefits of being a sheltered inland location: a mild climate and fewer foggy days. The downtown waterfront area in Benicia encompasses the Waterfront Promenade, Benicia Point Pier, and First Street Green. Enjoy a relaxing stroll along First Street or an invigorating hike along the trails in the State Recreation Area. The shoreline of the Carquinez Strait is the exclamation point to the beautiful, quaint downtown. Stroll the Promenade to the pier for bridge to bridge views and see fishermen, watercraft from sailboats to large ships, and abundant wildlife. Today, Benicia’s waterfront location remains one of the city’s greatest attractions. Check out Sailor Jack's Restaurant which once was a former sea captain's home. This seafood shack by the bay now swims with fresh fish fare. Peruse the many different art galleries, or stop in for a night cap at Cullen's Tannery Pub where you can enjoy a cocktail with nautical names like Garskey's Shipwreck or Terror of the Deep! In the morning, there are a great selection of cafes offering breakfast and brunch to help prepare you to get back underway. From Modern Sailing, plan on about 4 hours to get to Benicia. Approx. 4-hour return trip to Base. Time estimate varies based on winds and currents. Time estimate based on 5 knots average speed over ground. Add an hour for very rough conditions. It’s a long trip, but very easy to visually navigate in daylight. Study your chart before departure. Become familiar with San Pablo Strait, San Pablo Bay, and Carquinez Strait. Night navigation is straightforward with GPS. San Pablo Bay can get very rough when the wind is up. The docks at Benicia Marina are tight, especially in a larger boat. Experience/skill docking in Modern Sailing's narrow fairways should assist in docking at Benicia Marina. From Sausalito, head down the channel towards the bay. Once you are past the #4 day marker, turn east towards Peninsula Point on Belvedere and through Raccoon Strait. Once clear of Bluff Point, head north towards the San Pablo Strait. Roughly follow the shipping channel northeast, and then east through San Pablo Bay, and into the Carquinez Strait. Head north (magnetic) into the Benicia Marina. Once in the marina, the office is directly above the fuel/pump out dock, first building on your left. On the west side of the Strait, keep a lookout for the barge mooring buoys off Point San Pedro and The Sisters (two small rock islands), which are unlit. In the center of the Strait, red buoy #16 marks Invincible Rock, and red buoy #18 Whiting Rock, show a charted depth of 7 and 13 feet respectively. Most sailboats can sail right over them, but it's best to avoid them, especially if the seas are up. On the east side of the Strait, be aware that the current can run very strong between Point San Pablo and The Brothers islands. Do not sail between the two islands of The Brothers. Roughly follow the shipping channel. There are navigable depths of water well on both sides of the channel. Be aware that if you are on the north side getting close to the dike at Mare Island, there is a charted wreck where the depth goes shallow. The channel fairly wide, and you have good depth almost all the way to the shore in most areas, but do not venture into coves on the side of the channel, as they get shallow very rapidly. Keep a good watch for commercial traffic. When you reach green buoy #23, you are at Benicia. The channel turns SSW to go to green buoy #25, which clears a shoal and keeps traffic out of the General Anchorage off Benicia. A sailboat with typical draft can sail over all of this, but if in doubt of where to go, keep in the channel until you get to #25, and then turn north. The entrance to the marina has good depth, but is fairly narrow, as is most of the marina. The standard guest side ties are at the end of the fuel dock, which will be on your left as you enter the marina. If you were assigned a slip, you still need to stop at the fuel dock to go to the office and get your key. The gates in the marina require a key from both sides. View PDF link at the bottom of the page to view full Benicia Marina Map.